Shakyamuni Buddha, late 1st-early 2nd century A.D. The image of Shakyamuni- the historical personage called the Buddha, or Enlightened One, who lived in India in the sixth century B.C.Ñ made its first appearance in art in the late first century A.D. 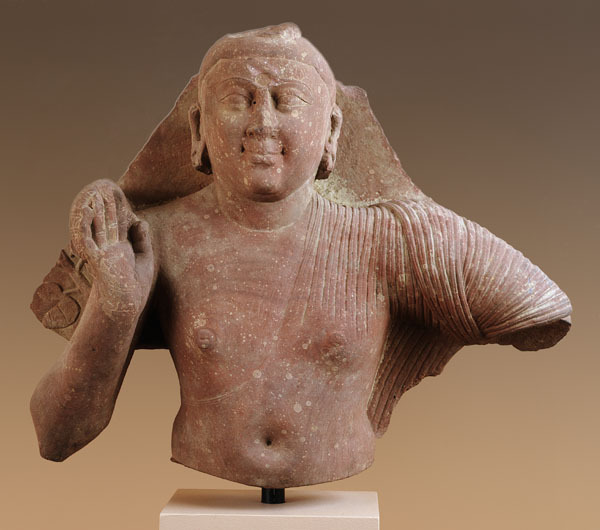 This fragment of a well-known Buddha image- characterized by a coiled topknot on the head- was produced early in the reign of Kanishka, the third ruler of the Kushan dynasty, and belongs to the type created in the Mathura region of North India. Typical attributes of Buddha figures in this period are a monastic robe, long ears, a cranial bump, a round mark between the eyes, a halo, and the right hand raised in the gesture of reassurance. Carved in relief on the slab behind the deity's right arm are leaves of the Tree of Wisdom (bodhi), under which the historical Buddha attained enlightenment. This figure of Shakyamuni, originally seated cross-legged in the lotus position, radiates a spirituality and repose that is entirely appropriate to the Buddha. The soft, tactile surfaces of the flesh and the warm, mottled sandstone create a sensuous and compelling image.